Thanks to the power of internet, with a single click you can contribute to 1.1 cup of food to a hungry person. And all it costs you is 2 seconds and nothing else! 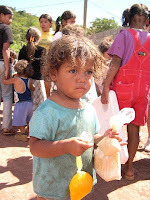 It is estimated that one billion people in the world suffer from hunger and malnutrition. Many in the world at this moment are dying of starvation. According to Food and Agriculture Organization of the United Nations, hunger and malnutrition are the underlying cause of more than half of all child deaths, killing nearly 6 million children each year. Yet the world has all the resource for us all, its just made imbalanced by our selfish hoarding of resources. The Hunger Site was founded to focus the power of the Internet on a specific humanitarian need: the eradication of world hunger. At The Hunger Site, you can click on a link and through the sponsorship of advertisers to the site food is donated to organizations that distribute it to those in need. THIS COSTS YOU NOTHING! The Hunger Site provides a feel-good way to help promote awareness and prevent hunger deaths every day - through easy and quick online activities. It does not require you to write a check or give your credit card number; it costs you no money. Since its launch in June 1999, the Hunger site has established itself as a leader in online activism, helping to feed the world's hungry. On average, over 220,000 individuals from around the world visit the site each day to click the yellow "Click Here to Give - it's FREE" button. To date, more than 200 million visitors have given more than 300 million cups of staple food. The staple food funded by clicks at The Hunger Site is paid for by site sponsors and distributed to those in need by Mercy Corps and America's Second Harvest. 100% of sponsor advertising fees goes to charitable partners. Funds are split between these organizations and go to the aid of hungry people in Africa, Asia, Eastern Europe, the Middle East, Latin America and North America. [>] Please remember to click every day or atleast on a regular basis to give help and hope to those most in need. Every click counts in the life of a hungry person. This is one very simple way that we can extend our charity all year, and God willing continue to feed those in need. Visit Hunger site and click on Click Here to Give Yellow button. thanks to Writeous Sister and Darvish Blog for spreading the word. I have incorporated the Hunger Site Button in the blog for quick navigation to the site, you may find it on the right menu panel in the middle.